Savour delicious cuisine and experience outstanding service at the premier Dunedin Hotel restaurant - Parcels Restaurant at Distinction Dunedin Hotel is open for breakfast, lunch and dinner. "Have no hesitation in recommending this restaurant that produced meals of what we felt an exceptionally high quality. We've dined all over the world and thought the dinner was as good as we've had anywhere". Robert H via TripAdvisor. Alternatively experience private dining with a unique twist. The original vaults of Dunedin's former Chief Post Office, now the Distinction Dunedin Hotel have been converted into private dining rooms. Setting the scene for intimate dining and special ocassions that require a unique touch of timeless elegance and nostalgia. 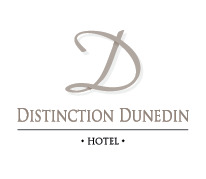 Relax in the stylish Post Bar at Distinction Dunedin Hotel and enjoy a drink with friends or colleagues after a busy day of work or exploring Dunedin and the Otago Peninsula. Experience delicious cuisine and outstanding service at Dunedin's Parcels Restaurant at Distinction Dunedin Hotel open for breakfast, lunch and dinner.